Monday - Friday : 9:00 a.m. - 9:00 p.m.
Saturday : 9:00 a.m. - 9:00 p.m.
Sunday : 10:00 a.m. - 8:00 p.m.
Get directions on Google Maps here! We are currently located at the intersection of Highway 50 and Old Collinsville Road in O'Fallon, just 20 minutes from downtown St. Louis! 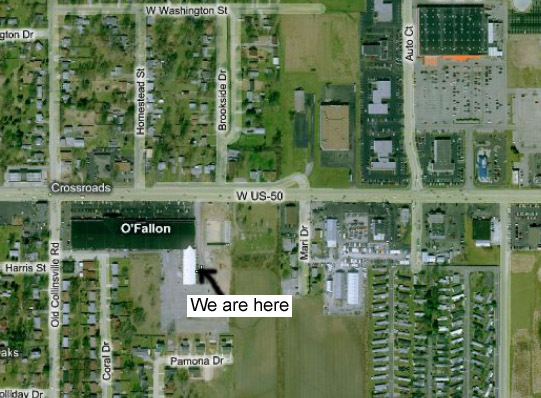 We are located in O'Fallon Plaza directly next to the Dandy Inn. Our store is on the left side of the building all the way at the end of the plaza. Take I-64 East to O'Fallon Exit 14. Take a right on Highway 50 from the interstate ramp. Follow Highway 50 about 1.5 miles. O'Fallon Shopping Plaza will be located on your left hand side at the intersection of Highway 50 and Old Collinsville Road. The Plaza has two big purple signs along the road. We are on the left side of the building all the way at the end of the plaza. Take I-64 West to O'Fallon Exit 14. Take a left on Highway 50 from the interstate ramp. Follow Highway 50 about 1.5 miles. O'Fallon Shopping Plaza will be located on your left hand side at the intersection of Highway 50 and Old Collinsville Road. The Plaza has two big purple signs along the road. We are on the left side of the building all the way at the end of the plaza.